Normally, the Siena plaza is big and calm, but during Palio di Siena, a horse race that takes place twice a year, things get ugly. It is too narrow for 10 horses to race and many riders fall off and horses fall. What do the locals eat while they get heated up with the thrilling race? Thick hard noodles made with wheat and water. 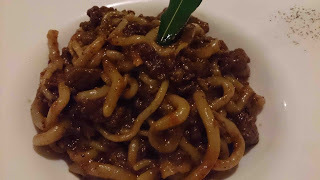 Italian Udon, made in Toscana. It is quite different from spaghetti. 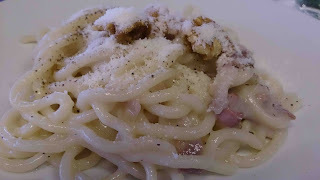 In front of Siena park, people eat cream and bacon PICI. It takes a lot of effort to chew on. This is interesting. I will walk around and try these. 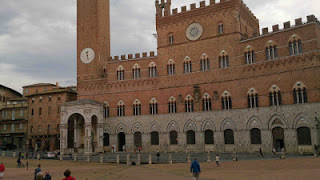 I came to the supposedly number 1 cafeteria in Siena. 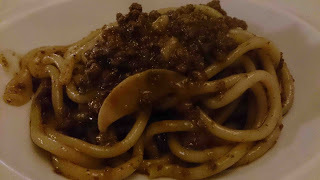 Italian Udon, PICI was a popular menu here too. A strong culture of wheat. Italian Udon PICI is strong. But it has no taste of salt. So you want to eat it with sauce that has a strong taste. 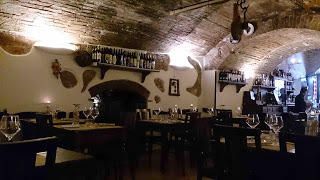 Wild boar ragoût is the classic sauce. 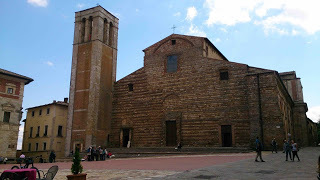 A small village called San Quirico in Toscana. In Japan, they used to call wheat, Merican powder. This is because they imported them from America. They should have called it Tarian powder. 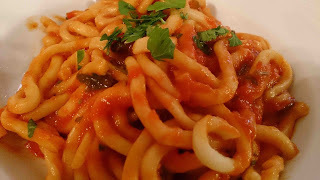 Garlic tomato PICI is thick, hard, and unrefined. I want to chew on it forever. As I eat, I think to myself, Japanese Udon has a lot of potential. The sun is still up, but bring on the thick red wine and Grappa! 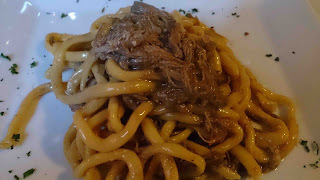 Italian Udon PICI, duck ragoût @ San Quirico. A famous comedian from back in the day once said Udon was a drink. He actually drank it. Montepulciano, an old village on top of Mt. Toscana. Later, I practiced drinking Udon without chewing on it for a few days. I was a child but I tried it with soft udon from Osaka, so I was able to do it. No way I can do it with Italian Udon, PICI. 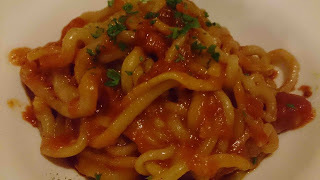 Italian Udon PICI, tomato garlic. There was another comedian who would eat Udon, sneeze, and pull out noodles form his nose. I cannot do that with these noodles. I would get a nosebleed. But I’m eating tomato sauce so I guess it’s okay. 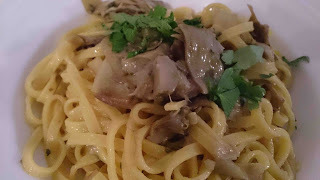 Wild boar ragoût, a classic sauce for Italian Udon, PICI. But there’s more boar meat than noodles. Can I get some strong red wine from Toscana? Also, do you have any white rice? 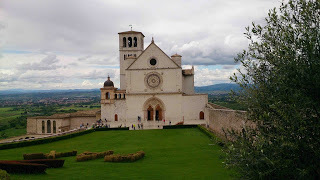 Next to the state of Toscana is Umbria, Assisi. Here too the Italian Udon awaits the pilgrims. 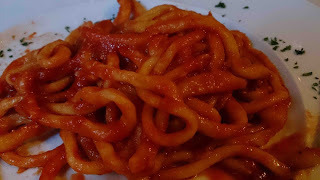 It is the same thickness and stiffness, but instead of PICI, it is called Strangozzi. This name gives it a better sense of how strong it is. 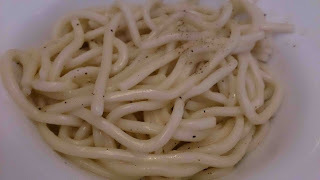 Cream and black pepper Strangozzi. Simple, but its strength stands out. Orvieto, top of Mt. Umbria. 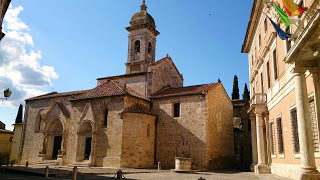 Upon arrival, a dignified strong cathedral from the 13th century awaits the pilgrims, and they cry. Eat Italian Udon and wipe your tears. This store had shortened pasta, so they called it Umbrian pasta instead of Strangozzi. Stiff noodles and ragoût with strong tomatoes. 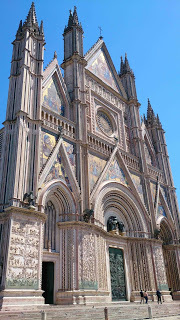 Orvieto is known for its strong white wine. Sorry, I cheated on you at the end. It said artichoke pasta, so I couldn’t stop myself from ordering it.